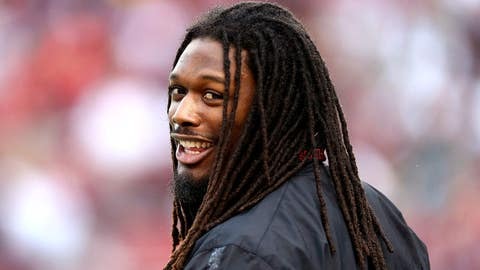 Jadeveon Clowney has mostly mesmerized college football fans in his time at South Carolina. Jadeveon Clowney had $450 to spend on electronics Monday. He did not invest it in a radar detector. “I was looking for them,” he joked. NFL general managers will file this latest development in their extensive Clowney notes. Is it further evidence of a kid more interested in life in the fast lane than life in the trenches? We’re no closer to an answer than we were when Clowney showed up at South Carolina. The junior defensive end is expected to turn pro after Wednesday’s Capital One Bowl against Wisconsin. Barring something disastrous on Wednesday, it means Clowney has made it through his NFL-mandated time in college. He did it without suffering the kind of injury that derailed ex-teammate Marcus Lattimore. He would have been a top-15 pick last year but suffered two serious knee injuries. You can’t blame Clowney for being careful after seeing that. Everybody agrees he is physically ready for the NFL. They’ve been saying that since Clowney showed up at South Pointe High in Rock Hill, S.C. But is he mentally prepared to join the real world of working professionals, where you can’t float by on talent alone? That’s what NFL GMs want to know. What’s Clowney going to tell them when the job interviews begin? Play time is just about over. Clowney will be going up against Wisconsin’s All-Big Ten tackle Ryan Groy on Wednesday. It’s his last chance to make an on-the-field impression on NFL scouts. There’s no doubt he’ll be one of the first players shaking Roger Goodell’s hands on draft night. But after entering the season as the consensus top pick, Clowney is now a wild card. He went from a school-record 12 sacks as a sophomore to three as a junior. Teams ran away from him and he had injuries. But Clowney also coasted and took himself out of the lineup minutes before the Kentucky game. He cited sore ribs, but skeptics wondered if the problem was more heart-related. Specifically, his ticker just isn’t that into football, at least the college kind. Clowney’s such a freakish athlete he hasn’t had to apply himself to make the highlight circuit. His helmet-flying hit on Michigan’s Vincent Smith in last year’s Outback Bowl has been viewed more than 6 million times on YouTube. Steve Spurrier joked that 1.4 billion Chinese now know the name “Jadeveon” because of the play. Throw in his trademark dreadlocks atop his 6-foot-6 frame, and you’ve had one of the more recognizable players in recent college history. Talent-wise, he has it all. But as Uncle Ben told Spiderman, with great power comes great responsibility. Just when you think Clowney is ready to fully accept his duties, he drives the other way. Fast. He was pulled over for going 110 mph a couple of weeks ago. That $445 ticket made such an impression he was nailed last week for doing 84 mph in 55 mph zone. Clowney told state troopers he was rushing to catch the team plane to Orlando. Again, Spurrier was joking. Nobody has gotten too serious with Clowney, who is perpetually smiling and easygoing. That makes him fun to be around, though NFL teams would just as soon their defensive ends be nasty and ruthless. Clowney was certainly enjoying himself Monday. The NCAA allows bowl perks, and the Capital One gives players $450 gift cards to Best Buy. Clowney was the only player strolling the aisles with a state trooper in tow. It’s not as if he needed protection, though one lady asked for his autograph. “He’s not allowed to do that,” the trooper told her. Like a lot of schools, South Carolina tightened its autograph policy in the wake of the Johnny Manziel autograph controversy. All the lady got from Clowney was a shoulder shrug and a smile, then he got back to the business at hand. So what does the man who has almost everything give himself? An Apple TV, an iPhone case and charger and, of course, a waterproof boom box. “Something nice and simple,” Clowney said. One more game and he’ll speed into the college sunset. Thanks for the memories, Jadeveon. You showed you truly have it all. Next, you need to show you truly want to use it.